Datawarehouse and Data Mart, both are storage components of HDFS. Data mart is such a storage component which is concerned on a specific department of an organisation. 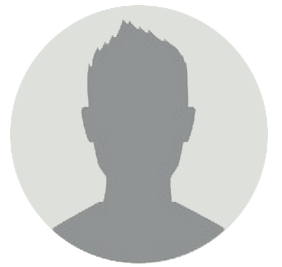 It is a subset of the data stored in the datawarehouse. Data mart is focused only on particular function of an organisation and it is maintained by single authority only, e.g.m finance, Marketing. Data Marts are small in size and are flexible. Dependent Data Mart is created by extracting the data from central repository, Datawarehouse. 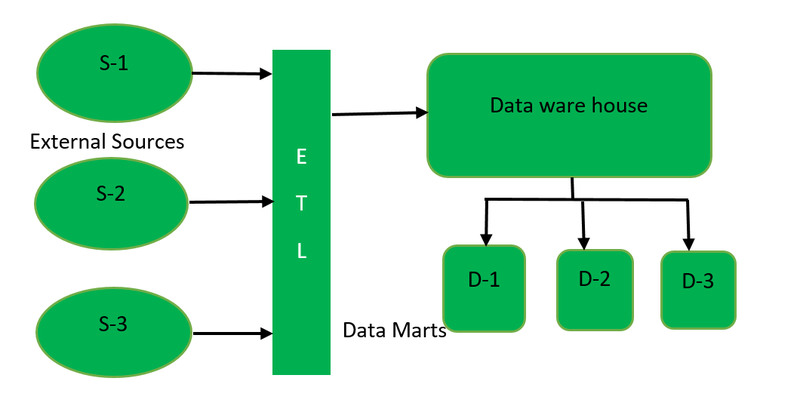 First data warehouse is created by extracting data (through ETL tool) from external sources and then data mart is created from data warehouse. Dependent data mart is created in top-down approach of datawarehouse architecture. 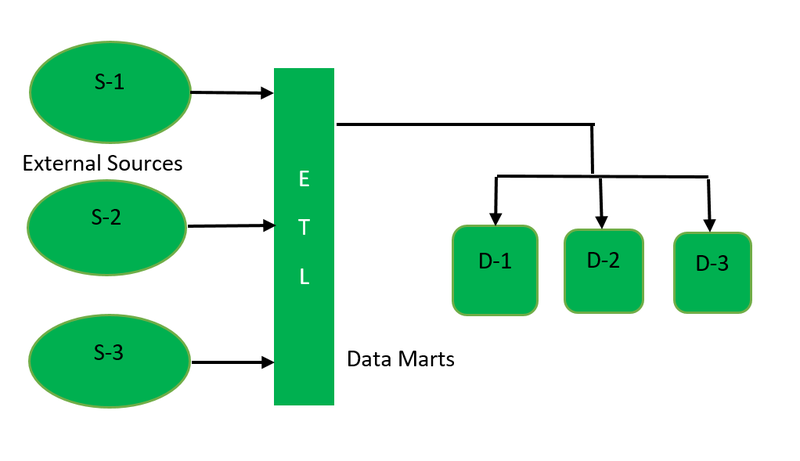 This model of data mart is used by big organisations. Independent Data Mart is created directly from external sources instead of data warehouse. First data mart is created by extracting data from external sources and then datawarehouse is created from the data present in data mart. Independent data mart is designed in bottom-up approach of datawarehouse architecture. This model of data mart is used by small organisations and is cost effective comparatively. This type of Data Mart is created by extracting data from operational source or from data warehouse. 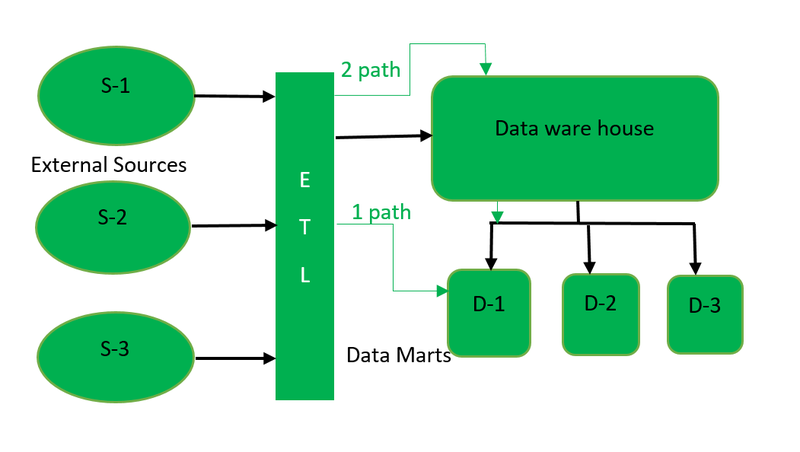 1Path reflects accessing data directly from external sources and 2Path reflects dependent data model of data mart. Data Mart focuses only on functioning of particular department of an organisation. It is maintained by single authority of an organisation. Since, it stores the data related to specific part of an organisation, data retrieval from it is very quick. Designing and maintainence of data mart is found to be quite cinch as compared to data warehouse. It reduces the response time of user as it stores small volume of data. It is small in size due to which accessing data from it very fast. This Storage unit is used by most of the organisations for the smooth running of their departments. Implementation of data mart needs less time as compared to implementation of datawarehouse as data mart is designed for a particular department of an organisation. Organisations are provided with choices to choose model of data mart depending upon cost and their business. Data can be easily accessed from data mart. It contains frequently accessed queries, so enable to analyse business trend. 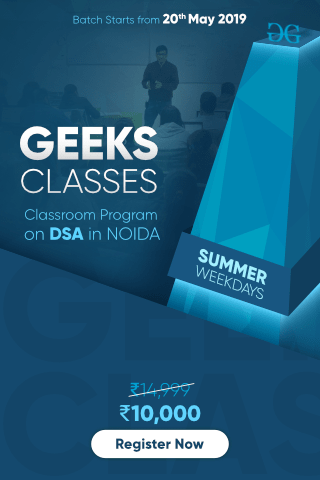 Since it stores the data related only to specific function, so does not store huge volume of data related to each and every department of an organisation like datawarehouse. Creating too many data marts become cumbersome sometimes.